Live Feed’ is a performance which opens a portal to an infinite world. A mother sits in a nursing room and soothes her baby to sleep. While doing so her eyes are covered with a VR headset. As she rocks the chair gently she is totally immersed in the virtual landscape apparent in the screen behind her. In this virtual space a similar looking mother rocks her baby too. 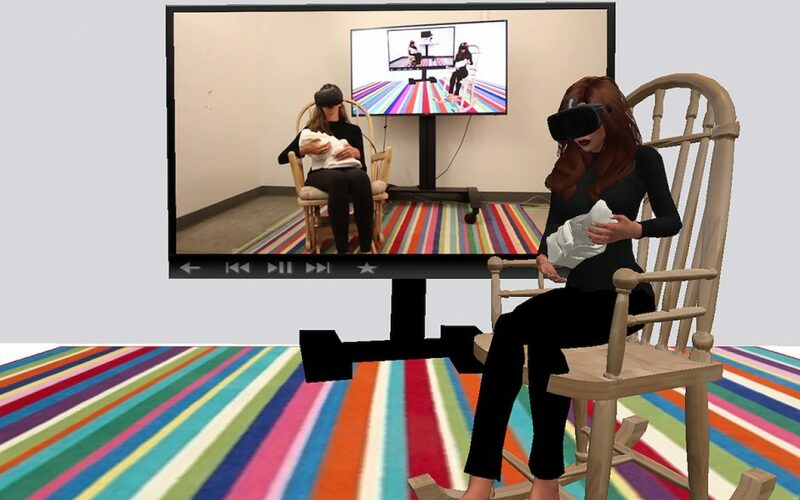 Just as the mother in the physical space, the virtual mother with her VR headset is immersed in a virtual world of her own, one that resembles the physical world. While each world unfolds into another world it becomes unclear which world is real and which is virtual.